FeastHome – Grey is really a timeless color. It won’t get out of trend for sure. Moreover, it always looks awesome on any kitchen’s feature including the backsplash. If you want to boost your property value, add a grey backsplash to the kitchen. 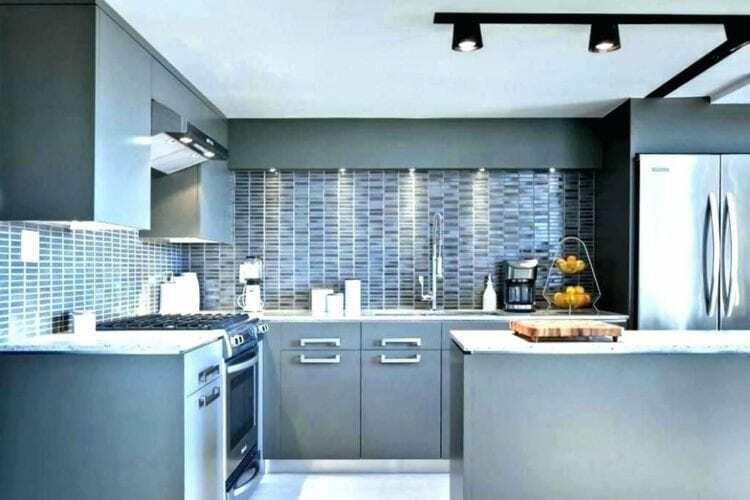 However, you might think that grey makes your cooking space bare and depressing. No, it is not true. 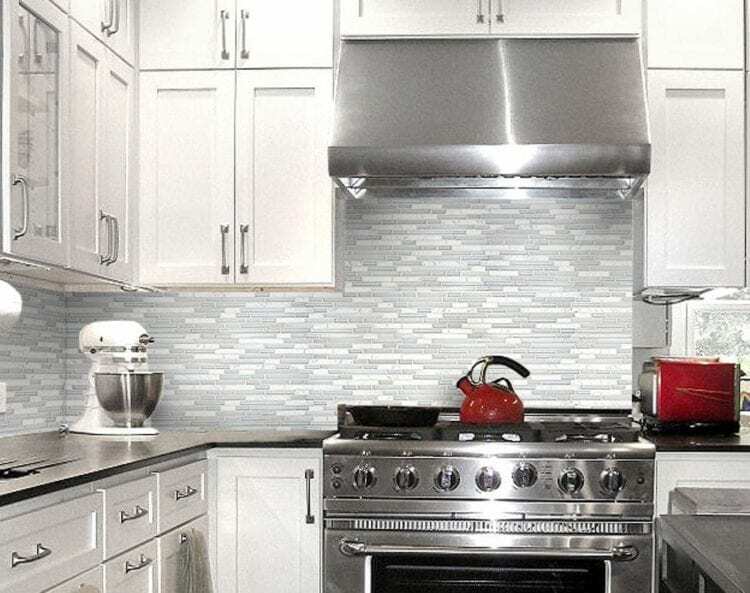 Here we have gathered up a bunch of backsplash ideas. From light grey shades too dark hues, let’s discover these! This pocket-sized culinary space truly benefits from trout grey glass backsplash tiles. They pop slightly against the white cabinet and work as a focal point. The quartz countertop gives visual interest and smooth texture to the kitchen. Blooming white flowers in blue glass vase revive the area. Since white and grey are categorized as neutral palettes, you never go wrong with them. 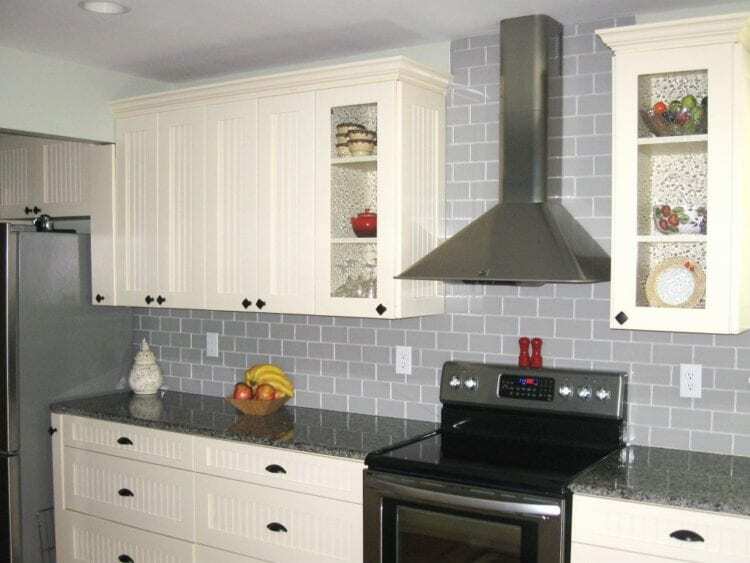 In this version, white grouts highlight subtle grey metro tiles on the backsplash. An oversized glass window allows the area to bathe in the morning sunlight. Stainless-steel appliances and tinware pot emanate an industrial feel. Red cooker control knobs inject a dash of energy into the kitchen. Does your kitchen need soft elegance? Give this idea a glance. The marble countertop is so enchanting. Then, the Chinese ceramics adorn the space. Dark wooden floor evokes warm atmosphere. Flowers in white vintage water jug perk the kitchen up. 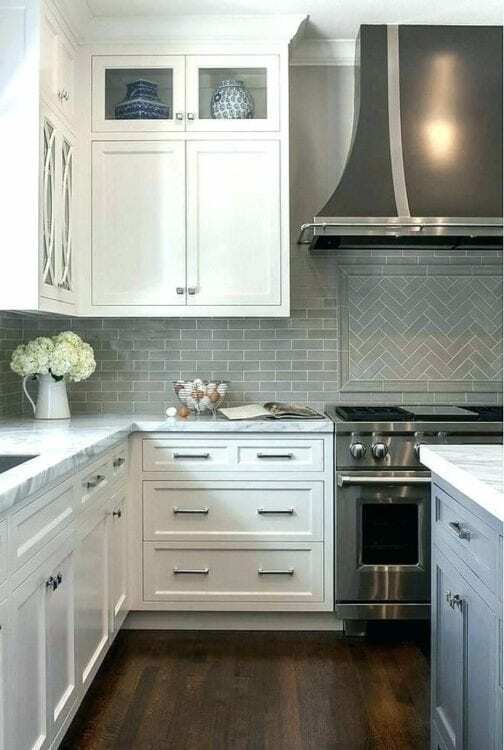 The backsplash itself is embellished with pastel grey metro tiles in brick and herringbone patterns. 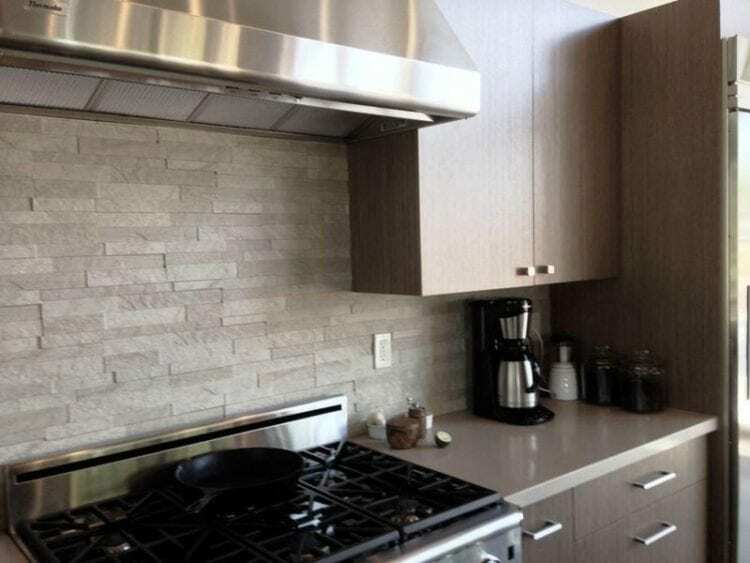 In this cooking area, the grey subway tiles are laid horizontally on the backsplash. Along with faucet and drawer knobs, they infuse traditional charm into the kitchenette. The exposed brick wall, wooden floor, stainless-steel appliances, and marble countertop provide layers of texture. Glass window keeps the kitchen breezy. 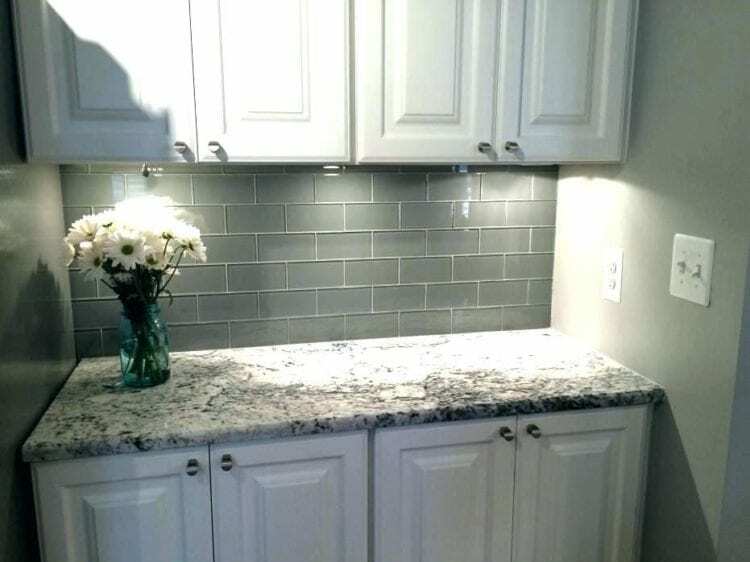 In this image, the glazed fossil grey subway tiles make for a glossy backsplash. They serve as an instant design facelift. Plus, they deliver dimension to the area in a snap. White marble worktop with grey veins exudes the luxurious air. Crisp white cabinets, wooden cooking utensils, and metallic appliances introduce rustic magnificence. This U-shaped kitchen is too ravishing to be true. 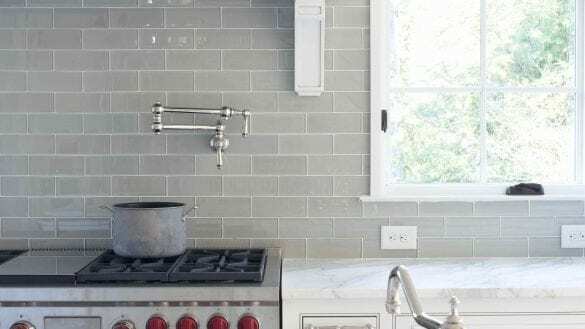 The light and grey skinny subway tiles cover the backsplash. They effortlessly catch the attention. 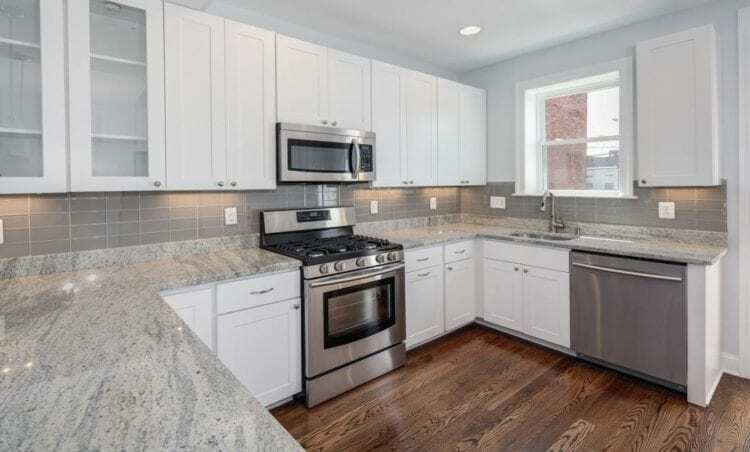 There are also stainless-steel countertop, cooker, and range hood. These units boast an industrial aesthetic. 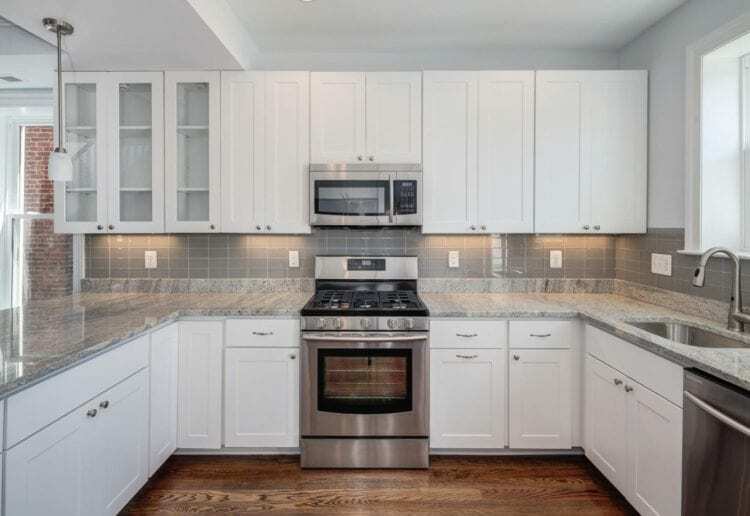 White cabinetry promotes a clean and neat environment. While a pop of carmine red invigorates the whole zone. When you are in doubt, go for a neutral space scheme. This cooking area features pastel grey subway tile backsplash wallpaper. It exhibits an image of serenity without breaking the bank. The ivory cabinets seem super charming. Black granite countertop, cooker, and range hood add drama to the kitchenette. Splashes of vigorous color prevent the room from feeling monotonous. 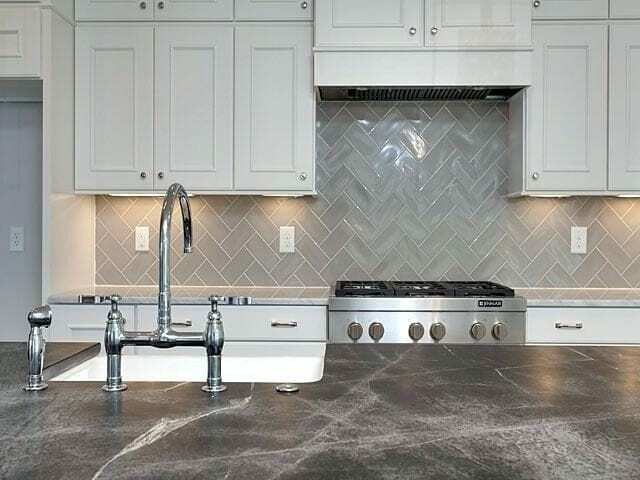 The glazed grey subway backsplash tiles are installed in the herringbone pattern. They work wonderfully with white wood cabinetry and marble countertop. Metallic cooker, faucet, and classic drawer knobs shine in a lovely way. Black concrete kitchen island offsets white crispness. Want to feel like you are outdoors? This idea is for you. The statement-making backsplash is clad in polished stone tiles. They have a wide array of hues from light grey to pale yellow. The granite countertop marries backsplash in a splendid manner. And a glass window helps get ample daylight into the area. The white ceiling, cabinetry, and countertop carve a stylish appearance. Glass windows are installed in order to give the area plenty of natural light. Metallic appliances and hardware set an industrial flair. Shimmery pastel grey subway tiles and floor soften the look. Both yellow flowers and ornaments on the countertop bring the room to completion. Needless to say, this kitchen is ultra modern with a traditional twist. Below the foot is the medium-toned wooden floor. It warms up the whole area. Sleek white cabinets neatly keep the utensils in place. The backsplash is made up of grey metro tiles. 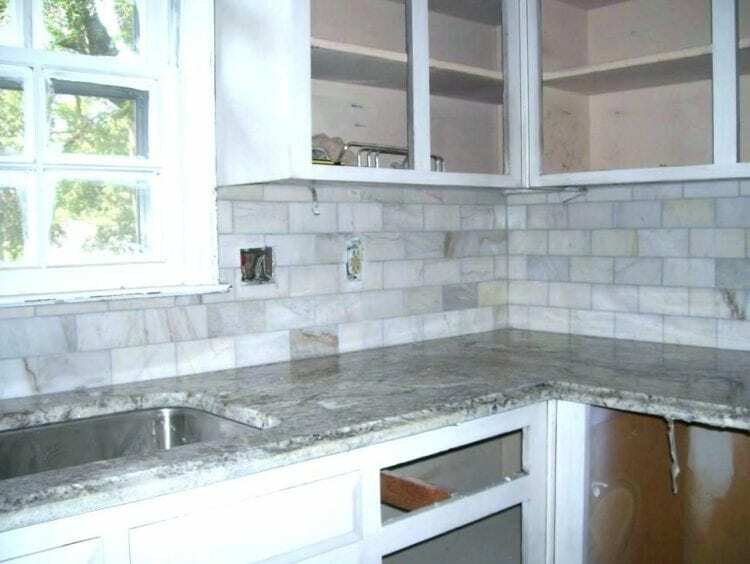 White and grey marble countertop retains the interest as well as conveys a lavish impression. It is no wonder that marble subway tiles remain top pick. They are versatile and pretty at the same time. Like the one pictured here, marble backsplash elicits posh air and spruces the kitchen up. White-painted bead-board cabinets and black granite countertop win favor in the space due to the fabulous contrast. The sunlight streams into the area through the window. Can’t decide between pale and deep grey? This kitchen is worth noting. The cloud grey flagstone tiles on backsplash inevitably develop a sense of rustic. The metallic range hood and cooker exhibit macho character. 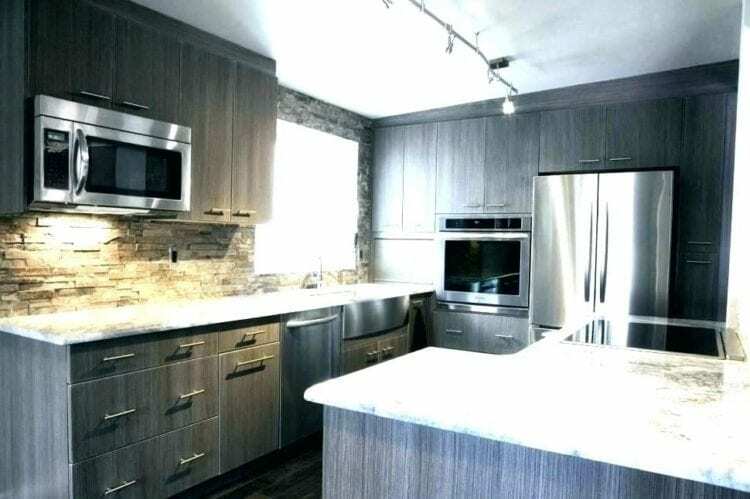 To prevent the area from looking boring, they are matched with ash grey countertop and mink grey cabinetry. Not a faint-hearted person? This cooking space definitely entices you. 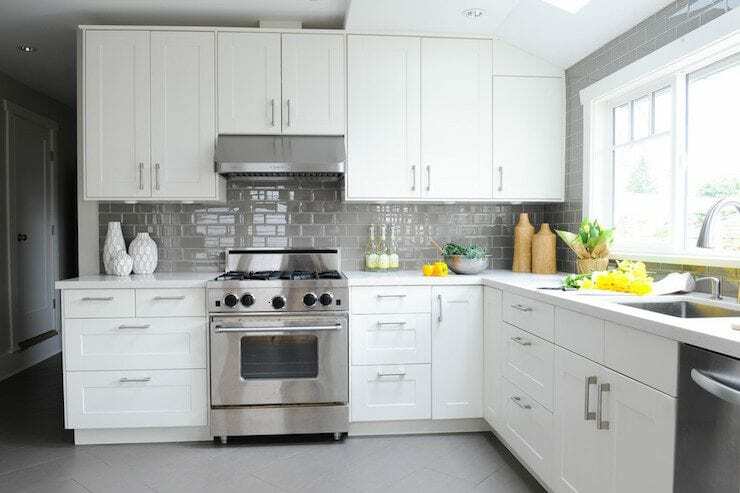 The muted grey subway tile backsplash wallpaper is greeted by granite countertop and pale yellow cabinetry. We guarantee you will also fall in love with the contrast between black drawer knobs and the cabinets. The blackened metal range hood and charcoal grey cooker invite natural drama. As you can see, white and grey divinely segment the cooking area. The steel grey cabinets and kitchen island embrace modern design. 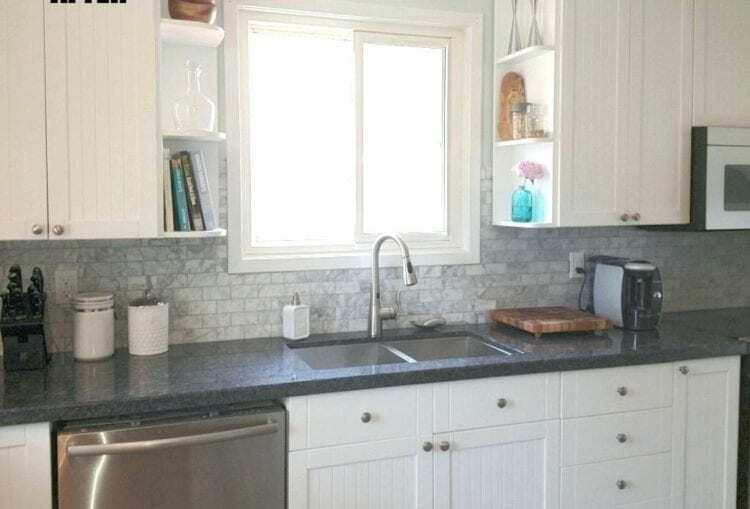 The backsplash is uniquely wrapped in shorter and skinnier subway tiles. And a jet black track light fixture steals the attention. The backsplash truly rocks in this kitchen. Thanks to the grayish stacked stone tiles. The fossil grey wooden cabinets rival white-painted ceiling. A huge window lets the sunlight illuminate the room. During evening hours, the kitchen is lit by an industrial-style track light. It is a culinary space that every man on earth wants. The grey cabinets with silver appliances release an industrial charm. 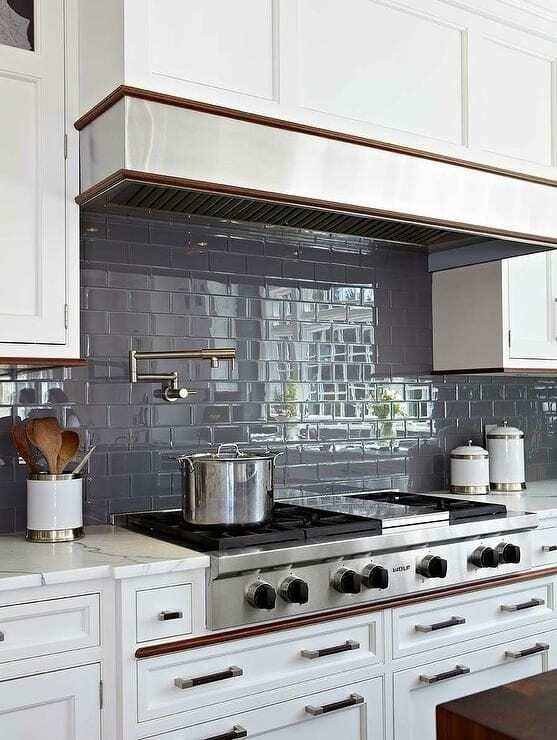 The thin subway backsplash tiles on backsplash are a feast for the eyes. A wooden board adds a hint of warmth to the L-shaped kitchen. We hope you get inspired by those grey kitchen backsplash ideas. They show you that grey is not drab, cold and dull. Would you use any of those for your next renovation?